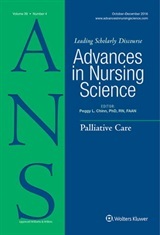 Our current featured article will be of great interest to ANS readers, in that the concept of “nursing’s patterns of knowing” is among the top search terms for the journal! The article is titled “Expert Nurses’ Perceptions of the Relevance of Carper’s Patterns of Knowing to Junior Nurses” authored by Louise Terry, PhD, SFHEA, LLB(Hons), FIBMS; Graham Carr, MSc, RNT, RN and Joan Curzio, PhD, RN. The authors have provided this description of their work, and also included the video at the conclusion! who are retiring. This provided the impetus for our study and underpinned the decision to provide funding by the General Nursing Council for England and Wales which was the regulatory body for nurses in England and Wales for over 60 years. Their mission now is to promote the development of the science and art of nursing for the benefit of society. glass tiles according to how they felt they weighted ethical values during their daily practice (see the photo on this blog). This visual metaphor formed the basis of some of the discussion around how ethical knowing is shaped, influenced and, at times, challenged by issues such as limited resources or poor nurse-patient ratios. In our paper, we mention that one of our participants brought in her hand-drawn version of a Picasso painting (see the photo on this blog) and as she discussed its depth, angles, hidden aspects, she explained how it exemplified nursing to her. She spoke of how it had taken her hours to complete the drawing but the physical activity of drawing was essential to her reflections on nursing. Perhaps this is typical of nurses as reflective practitioners – through doing they reflect and through reflection they develop their doing [practice]. phase 1 of the study. As explained, based on our study, we have proposed that a new pattern of knowing, Organizational knowing, should be recognized. Post-qualifying, nurses gain experience but do not necessarily learn from it. Good nurses were identified through our research as sharing certain qualities and knowledge which were consistent with Organizational, Socio-political and Emancipatory knowing. We all know good or wise nurses who are able to influence and improve patient care (praxis) as expert, fluid practitioners. In order to facilitate the transition from new nurse to expert to wise nurse attention, we believe that foundations for this need laying in the undergraduate, pre-registration nursing stage. Nursing curricula need to ensure that students develop the qualities and knowledge identified in Carper’s four fundamental patterns of knowing: Personal, Empirical, Aesthetic and Ethical and the importance of fundamental care needs to be reaffirmed. Students should be introduced to the concept of Organizational knowing and taught how to help themselves to ensure they gain this knowledge effectively in any organization in which they work or move to as junior nurses. As someone who teaches over 500 nursing students a year, I encourage each of them to keep an eye out in clinical practice for the wonderful nurse that they want to be like. Sadly, many of them tell me that they have yet to see that nurse even though they are half-way through their training. I tell them that when they do find that nurse, to ensure they work with them as often as they can and to absorb as much as they can from them. In addition, employing organizations have a role to play in ensuring that newly qualified or newly appointed nurses are supported to develop fully the qualities identified within the Organizational pattern of knowing. As Graham and I discuss in our short film, this is now beginning to happen as practice educators are incorporating the essential aspects for developing organizational knowing into their preceptorship and induction programs for newly qualified or newly appointed junior staff. Also, role modeling of good nursing should be recognized and valued by employers. We would also like to see universities/nursing schools do more to develop socio-political and emancipatory patterns of knowing, particularly in qualified nurses. Through this, nurses will benefit society. Finally, we hope that others will be excited by our ideas and further develop our concept of organization knowing. It would be wonderful if suggestions could be shared for developing organizational knowing and moving nurses through the hegemonic barriers that prevent the development of praxis and wisdom. Organisational knowing is a crucial aspect of preparing nurses to be fit for practice, role and purpose. Understanding systems, who has influence and how as a novice nurse you can influence improvements in patient care are crucial. I have in the past used Carper’s work to influence the development of masters in advancing nursing practice and feel the organisational knowing would be a very useful dimension.